Dodge Black Duck Decoy ca 1880s 2nd Grade Tack Eye Ex OP. 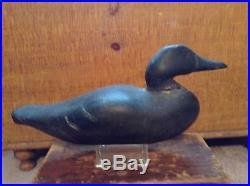 Being offered is a vintage early Dodge Black Duck decoy. 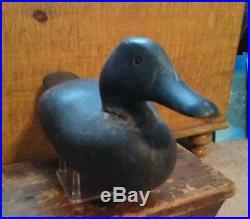 It is a Rare Dodge Black Duck in very good condition and what I believe to be original paint with expected wear. Wing patches may have been touched up sometime in the distant past. Much of the neck filler remains. 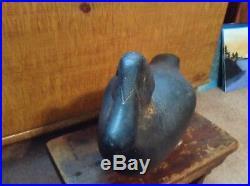 It has original tack eyes, and incised bill. 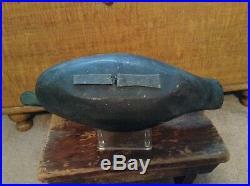 This is a large, heavy, very early Dodge, 2nd Grade Tack Eye, from the Early Factory Period ca. 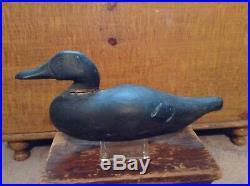 These early factory Dodge decoys are extremely hard to find, specially in this very good condition. About 16 from tail to bill. Please look at all the pictures as they are part of the description. 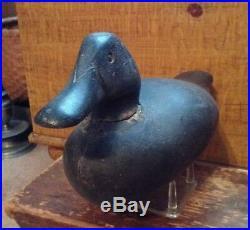 The item "Dodge Factory Black Duck Decoy ca 1880's 2nd Grade Tack Eye Ex OP" is in sale since Monday, April 8, 2019. This item is in the category "Sporting Goods\Hunting\Vintage Hunting\Duck Decoys". The seller is "rodrius_ipfdeb" and is located in Columbia, South Carolina. This item can be shipped to United States.